The Microsoft HoloLens Commercial Suite includes features that make it easier for businesses to manage HoloLens devices. Commercial features are included in the Windows operating system, but they are enabled by a license. In nearly all cases, the license is enabled by Microsoft Device Management when HoloLens enrolls in an organization. 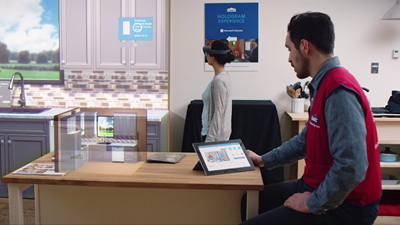 Contact your local Microsoft account manager to purchase the Microsoft HoloLens Commercial Suite. Mobile Device Management (MDM) for HoloLens. Your IT department can manage multiple HoloLens devices simultaneously using solutions like Microsoft Intune. You will be able to manage settings, select apps to install and set security configurations tailored to your organization's need. Data security. BitLocker data encryption is enabled on HoloLens to provide the same level of security protection as any other Windows device. Work access. Anyone in your organization can remotely connect to the corporate network through virtual private network on a HoloLens. HoloLens can also access Wi-Fi networks that require credentials. Microsoft Store for Business. Your IT department can also set up an enterprise private store, containing only your company’s apps for your specific HoloLens usage. Securely distribute your enterprise software to selected group of enterprise users. Commercial features like Microsoft Store for Business, kiosk mode, and enterprise Wi-Fi access are setup by an organization's IT admin. 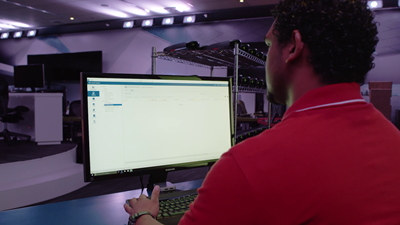 The Windows IT Center for HoloLens provides step by step instructions for device enrollment and installing apps from Microsoft Store for Business.